The right pergola will add style and finish to your home and give your property a more complete setting within the landscape surrounding your home. Weather it’s a suburban oasis or a sprawling country style verandah, adding an outdoor structure will add value to your property. By installing a pergola or patio from F. A. Hobson Landscaping, you are effectively increasing the floor space of your home. As the popularity ‘outdoor room’ gains momentum, a pergola will give your home the edge over a property that has not yet taken advantage of the extra space and comfort that an outdoor area can provide. 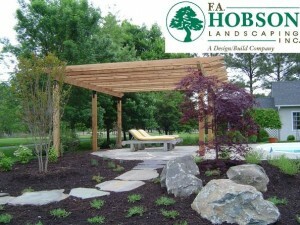 Installing a pergola from F. A. Hobson Landscaping can add a wonderful focal point to any garden or landscaped area. Planting vines and creepers beside your pergola can bring a lush and vivid beauty to your home. For instant color and aroma you could simply add pots of blooming annuals and herbs that can find at any garden center. We love spending time outdoors and what better way to increase your comfort in your own backyard than by having F. A. Hobson Landscaping build you a pergola. It will allow you to spend a lot more time outside when perhaps it might not have been possible or comfortable without one. A covered outdoor area would let you enjoy a hot cup of tea on a rainy afternoon and yet still enjoy the sensation of being outside. The blistering hot days of summer would no longer prevent you from enjoying time outdoors with a shady, covered oasis. A modern and dynamic or discretely designed pergola can add beauty and style to any home. With so many materials and designs to choose from F. A. Hobson Landscaping, we can find a solution to improve the outside and entry points to any home. Adding more space and comfort to your home is reason enough to start thinking about pergolas. Entertainers will relish in the ambience that a tastefully decorated pergola can bring to any party or gathering. Gardeners can enjoy their plants and flowers from the comfort of their patio. Families can enjoy a spontaneous alfresco dinner or weekend lunch under the cover of a pergola. Bringing the outside in, a covered outdoor area will add value to your home and lifestyle by introducing a new kind of space and comfort to your domestic experience. Your property can look this good with F.A. Hobson of Queenstown Maryland.